Repair and Refurbishing Services - Remcon Equipment, Inc. - Remcon Equipment, Inc.
Every plant has a unique set of operating conditions, budget and throughput rate requirements. Remcon can develop a customized repair package to suit your individual needs. From replacing single components of a conveyor, to complete refurbishing of a system, we will work with you to get your equipment running quickly and cost effectively. Consider refurbishing before buying all new equipment. 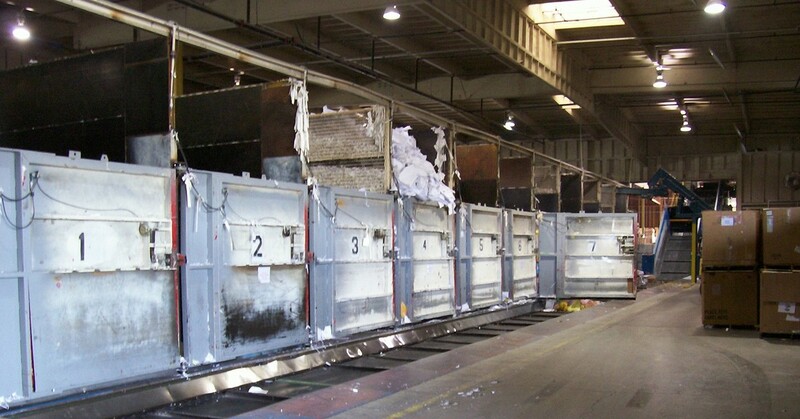 If you have old conveyors that you are thinking of discarding and replacing with new equipment, you might want to consider refurbishing the old ones first. 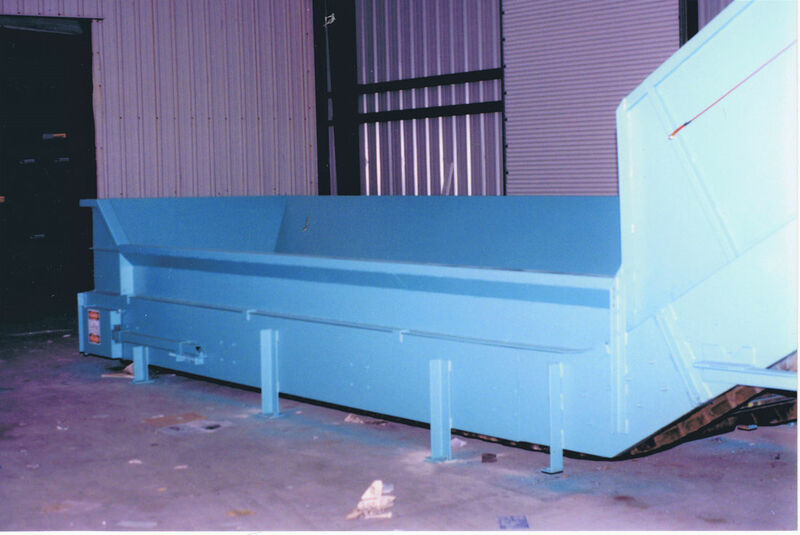 A well designed conveyor can often be refurbished for a much lower cost than designing, building, shipping, and installing a new conveyor. Steel does not "go bad" or deteriorate with age. Steel can be worn thin from moving parts, eaten away by rust, bent, or torn; but the actual steel material is the same as it was when it was original. Steel is also relatively easy to straighten or to replace damaged sections. ​Choosing to refurbish can not only restore non-functioning equipment back to its original working state, it can also allow the equipment to be upgraded for a worthwhile price. Components of the equipment can be upgraded to high performance parts, problems that have been discovered during the operation of the machinery can be corrected at the source, and flaws in the original design can be fixed to make the machine function better. Other programmable settings for speed, acceleration & deceleration, etc. Many times while working on existing equipment we discover problems in the design, fabrication, or installation of a machine which have led to problems during the regular operation of that machine. If we become aware of these design problems during the planning phase of the repair process, we will discuss adding or changing features of a conveyor, and the advantages, with our customers. If these design flaws are not discovered until a crew is on-site to refurbish the machinery, they can often be easily fixed during the refurbishing process without adding significant time or cost to the project. 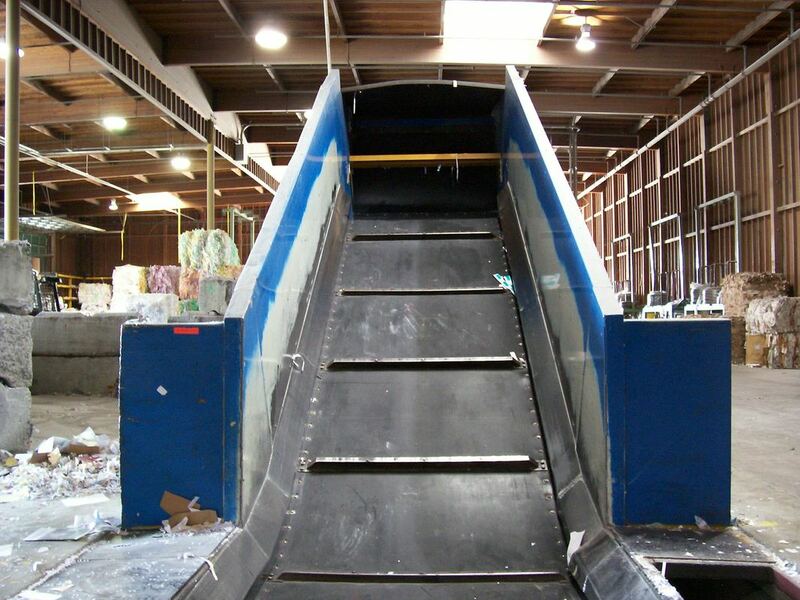 Changing a conveyor bed from a solid bed style to a bed slat style to eliminate dirt buildup underneath the conveyor belt. New in-ground section welded to old above-ground section, getting new wear liner plastic fitted, and prior to installing upper walls. The photos above show the first of a two conveyor baler feed line. Remcon was hired to build and install replacement combination drag chain and rubber belts for both conveyors. 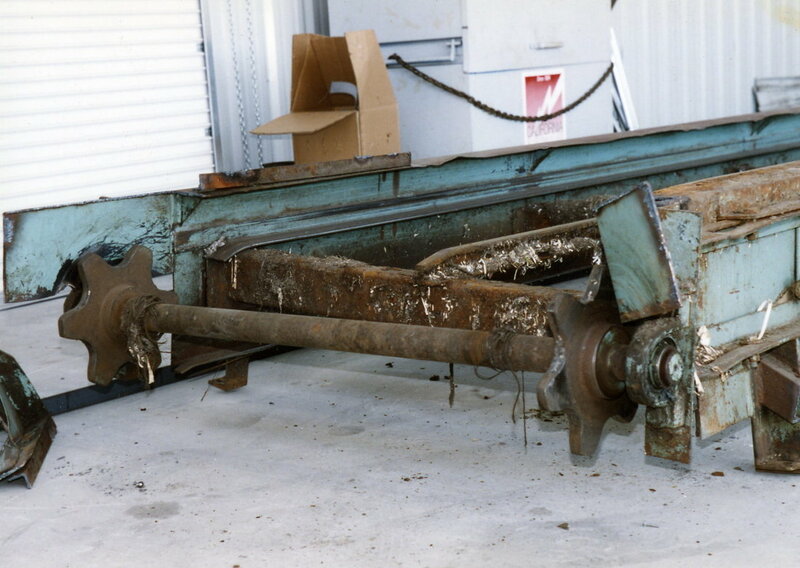 After looking at customer photos of the condition of the conveyors, Remcon saw that the in-ground portion of the first conveyor was badly rusted and worn due to being underwater during much of its use. Instead of replacing the whole conveyor, Remcon fabricated a new in-ground section in their shop ahead of time. 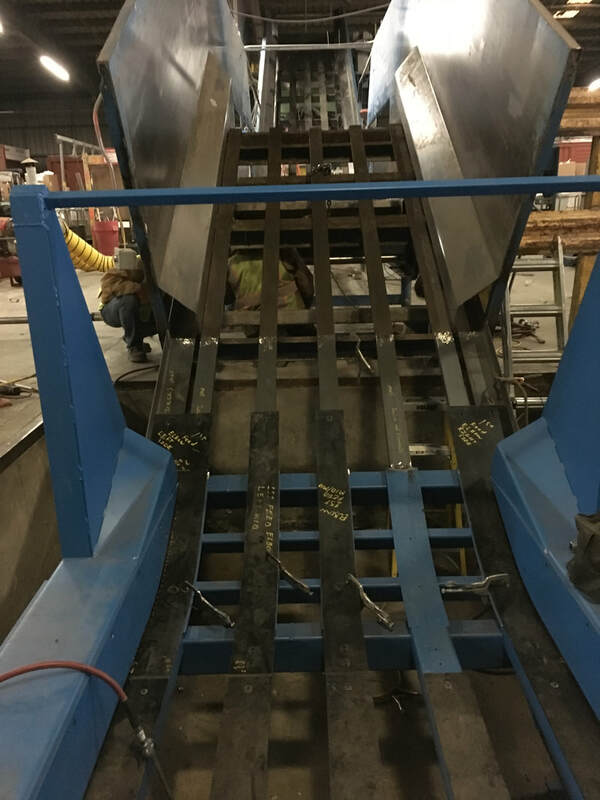 They shipped this new section of conveyor to the job site and fitted it to the above ground portion of the conveyor on-site during the rest of the work involved in replacing the belts, drive components, and wear parts on both conveyors. 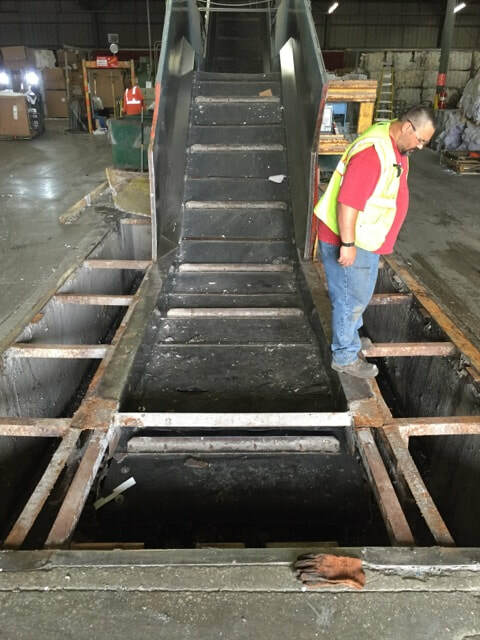 Remcon also supplied and installed new, heavier-duty pit plates and supports around the in-ground portion of the conveyor. 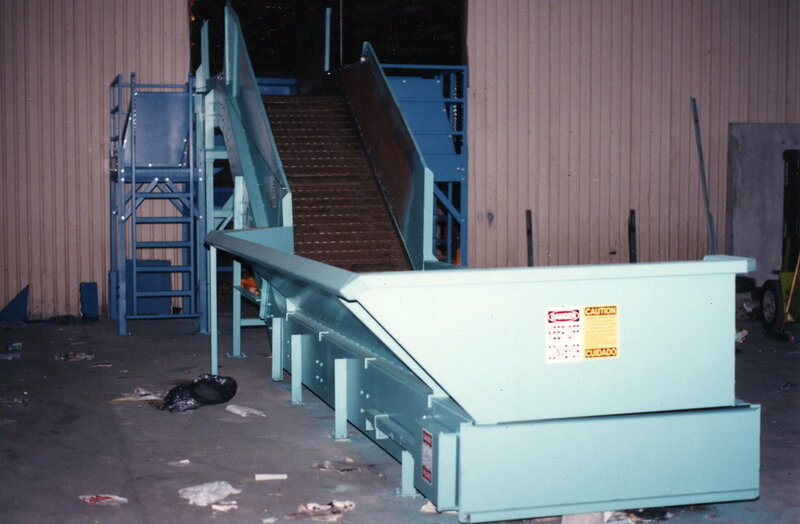 The above photos show a drag chain conveyor that Remcon reconfigured in 2001. 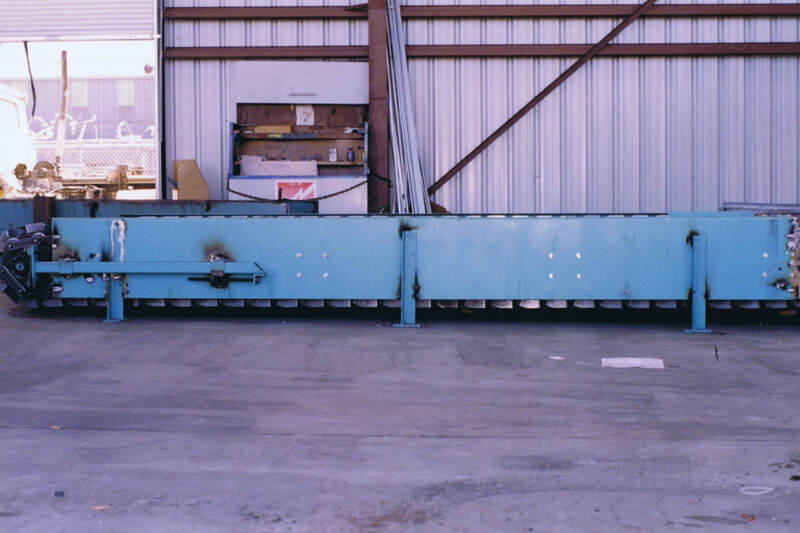 The in-ground horizontal section of the conveyor was a more than 10 year old Karl Schmidt drag chain conveyor (one of the first drag chain conveyors to be used for recycling), which we helped move from another plant. 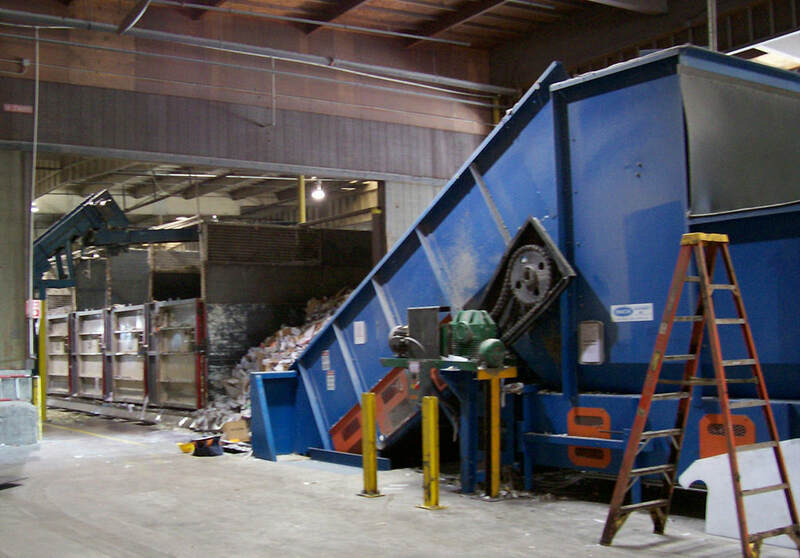 Remcon designed a new elbow up section to match the existing conveyor style, lengthened the Karl Schmidt conveyor, and attached the new elbow up and incline sections to the in-ground section. The gearbox and motor from the original conveyor were reused on the modified conveyor, (as seen in the first photo). We also added pit plates and supports to custom fit the in-ground portion of the conveyor (as seen in the second photo). In 2008, we built and installed a new chain belt for the conveyor, and replaced sections of damaged track and straightened bent frame members (which was when these photos were taken). 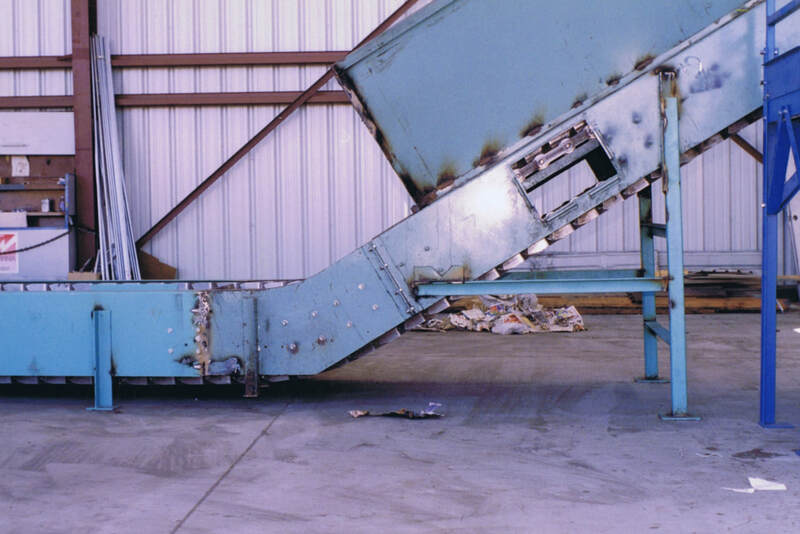 The above photos show a steel belt roller chain conveyor that Remcon refurbished when reconfiguring a conveyor system in 1994. 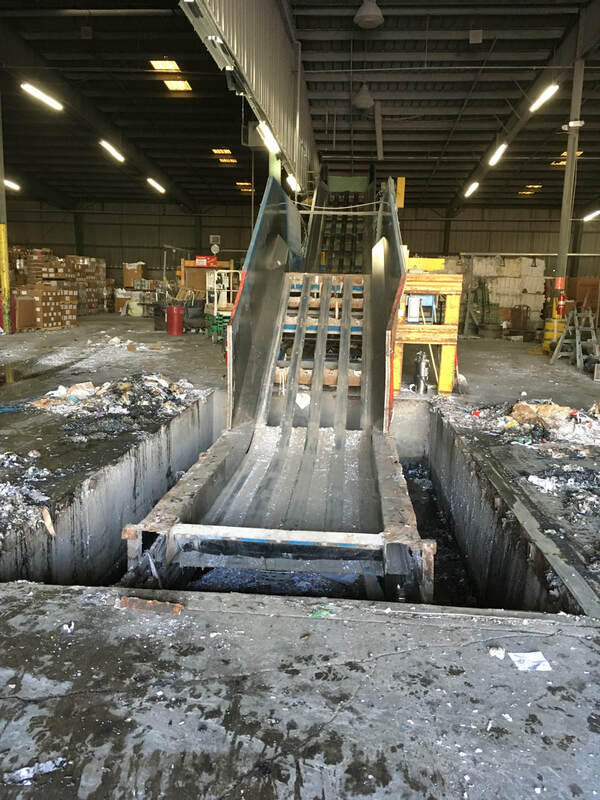 As the old belt was removed, we discovered that the tracks, impact beams, and body of the horizontal loading section of the conveyor were badly worn, bent, and deeply rusted. 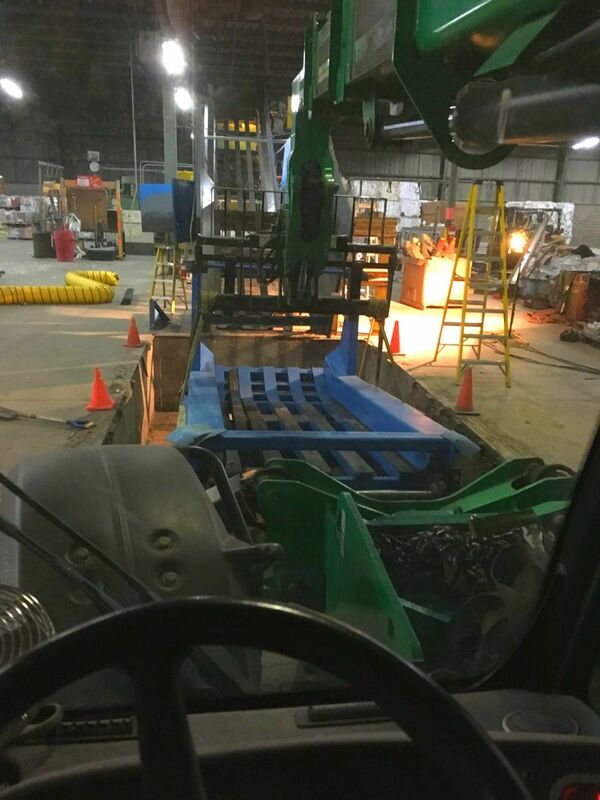 Remcon sent a drawing of the loading section to their shop and had a replacement section built and shipped to the site in two days, which they attached to the used conveyor. They also added a specially designed infeed hopper to the loading section of the conveyor, as well as the inspection stations, as can be seen in the photos above.